The Perry Lithgow Partnership has been in business for 35 years and over that time has acquired extensive experience on painted schemes on a variety of media dating from the C12th to the C20th. 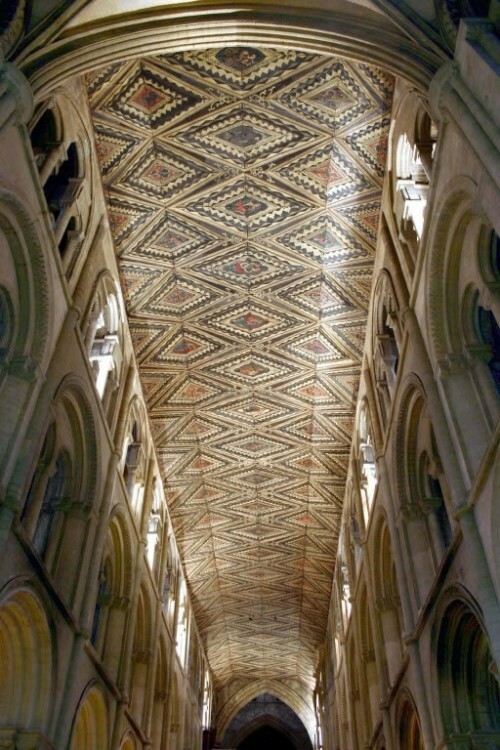 Major projects include: the C16th High Great Chamber Frieze at Hardwick Hall (NT), the C13th Nave and Transept Ceilings and C15th Presbytery and Apse ceilings at Peterborough Cathedral; extensive C13th to C17th wall paintings at St Alban’s Cathedral; the unique Romanesque frescoes in Cormac’s Chapel, Cashel, Ireland; and the C18th Staircase and Entrance Hall schemes by Sir James Thornhill at Hanbury Hall (NT), for which we won the major industry award; The 2010 Pilgrim Trust Award for Conservation. The Guild Chapel, Stratford-upon-Avon was awarded the 2018 SPAB (Society for the Protection of Ancient Buildings) John Betjeman Award following the conservation of the Doom and Allegory on Mortality wall paintings. We provide a full range of conservation services including, project consultancy, condition surveys, monitoring and technical analysis, photographic and digitised graphic recording, as well as participating directly in a wide range of remedial conservation treatments. The Partnership has good long-term working relationships with a number of experienced wall painting conservators whom we employ regularly. Four of our regular assistants are accredited members of ICON in their own right and all the others are properly trained. In addition, we pride ourselves on always having at least one partner on-site throughout a project. The directors make a point of attending as many conferences, site-visits and case-study days as possible in order to expand our knowledge and keep up to date with new materials and treatment processes. We place great emphasis on raising the standards of documentation and have worked in close contact with the National Trust, leading conservation architects, English Heritage and Church Buildings Council in designing formats for condition surveys and conservation records, especially with regard to digitising information, graphic and photographic recording. In addition, Mark Perry is an assessor for the Institute of Conservation (ICON) accreditation process and Richard Lithgow is a recent co-Chairman of ICON’s Stone & Wall Paintings Committee and currently a CPD reader for ICON.